On September 11, 2012, by 6 p.m. Eastern Daylight Time, the attack by a terrorist group associated with al-Qaeda was still underway against our consulate and CIA compound in Benghazi, Libya. By this time the whereabouts of Ambassador Chris Stevens were unknown, but the State Department had been informed of the attack and that Sean Smith had been found dead. Thanks to new information uncovered by the Benghazi Select Committee, we now know for a fact that, at least in private, Clinton was telling the truth — telling others that an anti-Muslim YouTube video had absolutely nothing to do with what she immediately knew was an organized terror attack, and one that resulted in the murder of four Americans, including our ambassador. Go into the video a few minutes and listen to the truth about Benghazi, guns, Hillary & Obama! You’ll remember that in the second presidential debate, Obama said that as “soon as I was aware the Benghazi consulate was being overrun, I was on the phone with my national security team.” The not-so-subtle intimation is that Obama was stepping up to the protect the U.S. personnel who were in Libya. And in the wakes of their deaths, which weren’t “optimal,” we have been assured that stronger action wasn’t taken stronger because those options weren’t available. ​mails Clinton received or sent on Libya. Uncle of State Dept information officer Sean Smith, Michael Ingmire states: “Hillary Clinton is a serial liar”. As with all complex stories the valuable discoveries come with time. We now have a pretty good understanding of who, what, where, and why surrounding the 9/11/12 attack on the U.S. compound in Benghazi Libya. We are also better positioned to understand why, or perhaps more importantly why not, certain actions were taken before, during, and in the immediate aftermath of the attack itself. IT IS IMPORTANT TO NOTE THIS OPERATION WAS WAS PUT UNDER THE MILITARY COMMAND AUTHORITY OF NATO - NOT THE U.S. MILITARY! President Barack Obama signed a secret order authorizing covert U.S. government support for rebel forces seeking to oust Libyan leader Muammar Gaddafi, government officials told Reuters on Wednesday. Obama signed the order, known as a presidential "finding", within the last two or three weeks, (March, 2011) according to government sources familiar with the matter. "As is common practice for this and all administrations, I am not going to comment on intelligence matters", White House spokesman Jay Carney said in a statement. "I will reiterate what the president said yesterday -- no decision has been made about providing arms to the opposition or to any group in Libya." News that Obama had given the authorization surfaced as the President and other U.S. and allied officials spoke openly about the possibility of sending arms supplies to Gaddafi's opponents, who are fighting better-equipped government forces. The United States as part of a coalition, with NATO members and some Arab states, which is conducting air strikes on Libyan government forces under a U.N. mandate aimed at protecting civilians opposing Gaddafi. Interviews by U.S. networks on Tuesday, Obama said the objective was for Gaddafi to "ultimately step down" from power. He spoke of applying "steady pressure, not only militarily but also through these other means" to force Gaddafi out. Obama said the U.S. had not ruled out providing military hardware to rebels. "It's fair to say that if we wanted to get weapons into Libya, we probably could. We're looking at all our options at this point," he told ABC News anchor Diane Sawyer. The goal of the progressive socialist Left is power, and as advocated by their Rules for Radicals mentor, Saul Alinsky, it is achieved through the politics of fear, intimidation and character assassination. Furthermore, the Left will coalesce to protect its sacred cows of worship and sacrifice anyone – including a U.S. Ambassador, two former U.S. Navy SEALS, and a State Department specialist — all Americans. The Left will lie and do whatever is necessary in order to ensure Obama and Hillary Clinton are protected — including disparaging the individuals who were there on the ground and recovered the dead American bodies. Because to the Left, Bowe Bergdahl is heroic, not warriors who disobey an order and run to the sound of the guns. NYT, Hillary, Obama's War On A Mom! In a shameless glaring act of hypocrisy to rehabilitate Hillary Clinton’s presidential aspirations, the New York Times published an article doubling down on the Obama Administration’s lie that the attack on our consulate in Benghazi was due to an anti-Islam video. Meanwhile, the NYT, Hillary and Obama have displayed a “Pat who” attitude towards Pat Smith, the mother of Sean Smith who was killed in the Benghazi attack on Hillary’s watch as Secretary of State. What makes the attitudes of these superior, arrogant and pompous liberals so hard to stomach is that they falsely portray themselves as champions of women. In reality, NYT, Hillary and Obama consider American lives acceptable collateral damage in furthering their socialist/progressive agenda; Obama's vowed fundamental transformation of America. Thus, the Administration stonewalling by refusing to release facts about what led to the death of Pat Smith's son in Benghazi is par for the course – mere collateral damage. Over a year ago, Hillary looked Pat Smith in the eye and lied to her face. So much for Hillary's commitment to the sisterhood. 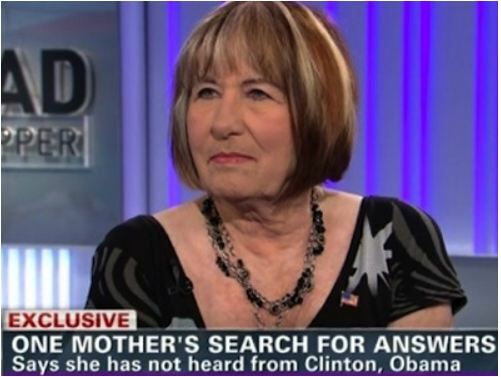 Obama promised Pat Smith answers regarding her son's death. Pat is still waiting for answers about what happened. But then, what else could you expect from a president recently awarded Liar of the Year? Yes, liberals like the NYT, Hillary and Obama only give a rat's derriere about liberal women that they can exploit to further their liberal agenda. Cindy Sheehan was a liberal darling until she could no longer further their cause. Then, Sheehan was thrown away on their pile of broken lives and dreams sacrificed for their agenda. These people, NYT, Hillary and Obama are always railing about their phony bologna made-up GOP War on Women, all the while displaying a callous cold disregard for Pat Smith who has been simply seeking the truth about the greatest loss of her life. Thus, the NYT, Hillary and Obama are guilty of launching a war on a mom, Pat Smith. Ms Smith, I am confident I speak for millions of Americans. We are deeply sorry for the loss of Sean, your brave son. Our prayers and support are with you. May God bless you and your family. 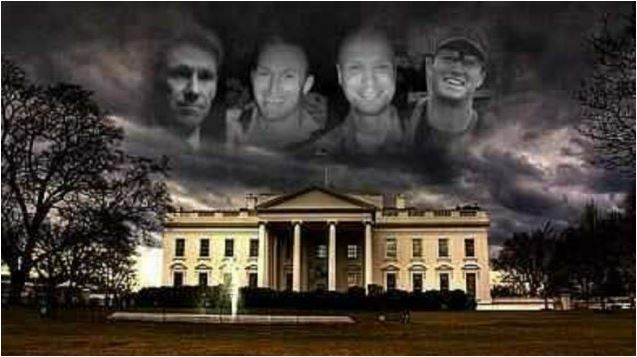 I can't say this news is surprising, considering the documented reports we have of terrorists acting as security for our diplomatic mission in Benghazi, but reports are now coming out that the jihadists who attacked the mission in Benghazi on September 11, 2012, had insider knowledge. To top that off, calls for more security, as well as calls that night for help were all ignored by the Obama administration. Fox News Reports: The terrorists who attacked the Benghazi consulate last year knew the location of the safe room where Ambassador Chris Stevens and his security team sought shelter, according to a congressman who spoke for 90 minutes with the diplomatic security agent severely injured in the assault. 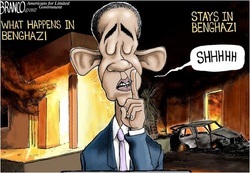 Benghazi Witnesses Quizzed In Secret House Committee Hearing! A U.S. House panel took testimony despite the chairman being told it could hurt prosecuting the U.S. Consulate in Libya terrorists, the Los Angeles Times said. Putting the lie's in place! Admiral Gaouette was going to assist General Ham. Both Admiral Gaouette and General Ham have been relieved of duty. Leon Panetta, the Secretary of Defense, states that he and “the Generals” all agreed that it was to dangerous to go in. So what happened to Obama’s order???? Obama stated CLEARLY has gave an order to secure our personnel. However as we all know NOBODY went in to help them. Did Panetta refuse to follow the Presidents order or did Obama lie when he stated he gave the order?